In my first weeks as Chief Executive at the Environment Agency - back in December 2015 - I took the train up to Hemel Hempstead to see our work restoring the River Bulbourne. This week I was able to revisit the project to see how the river has developed and talk about how we are working with our partners to protect and restore other chalk streams in the area. The transformation is remarkable. Before - as a result of historic alterations - the over-wide river was slow, silty and dead straight. Now, the crystal clear water flows over clean gravels. It’s green, lush and full of life. And it’s a brilliant example of a chalk stream. Chalk streams are an iconic, evocative and quintessential part of English countryside. Flowing from chalk aquifers the rare conditions create unique habitats for some of our most treasured and threatened wildlife including brown trout, water voles, damselflies and kingfishers. They have delighted artists, writers and anglers for centuries. It has long been clear that chalk streams are threatened. Population growth, particularly north of London, has put pressure on them as a source of drinking water. Historic alterations and artificial additions have restricted wildlife and habitats. 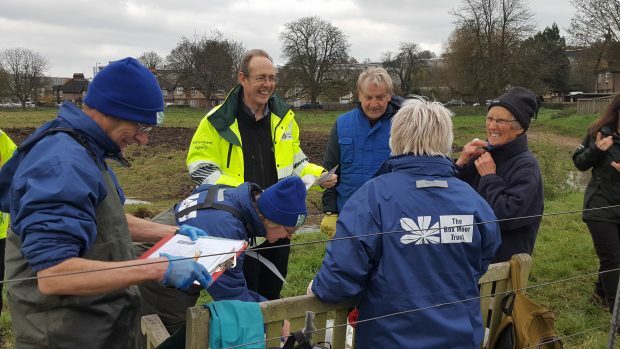 The Chalk Streams Partnership is a collaboration between the Environment Agency and Affinity Water alongside numerous partners and landowners. We are collaborating with Affinity Water to reduce abstraction from 11 pumping stations on 7 chalk streams, transforming flows in an area of significant water stress and improving this unique and rare environment to for the benefit of people and wildlife. By 2024, this will mean an extra 70 million litres of water a day that will remain in the environment. To capitalise on the improved flow, we are working with other partners and landowners to carry out a programme of ambitious river restoration projects. Over £5,000,000 is being spent on nearly 100 projects. We are removing physical modifications (including up to 52 weirs or similar obstructions!) in order to improve biodiversity and provide assets that local communities can be proud of. 2 pumping stations have already either ceased or significantly reduced abstraction and a host of restoration projects are coming to fruition. As well as improving habitats for wildlife, we want to make the rivers more visible and accessible for people to enjoy. In St. Albans, the ornamental Verulamium Park lakes suffer badly from water quality issues. We are working with St Albans City & District Council to find solutions to this alongside our work to improve the River Ver. Just up the road from Boxmoor, at Gadebridge Park in Hemel Hempstead, the river is currently pushed to the side of the park as a result of historic milling industry. We are working to restore the original river channel back through the middle of the park - installing an access beach and features which will allow children and park visitors to interact and appreciate the improved river. With projects like these, alongside abstraction reductions, I believe that the Chalk Streams Partnership is the best opportunity that we have ever had to protect and safeguard these beautiful resources, so that future generations will be able to enjoy them. This is a fantastic example of the work Environment Agency staff do every day, up and down the country, to create a better place. All the rivers in Hertfordshire are in serious peril from abstraction. Pushing a story like this is like trying to find a good story on a massacre. Perhaps Sir James should visit the upper Colne , you won’t need your wellies. Affinity have no water storage. Thousands of new homes . No planning = no future . Everyone knows it apart from the EA and the Government. Ignorance is bliss. Will the Environment Agency please make a statement on the River Colne situation please. How about congratulations on some good work completed on the rivers in Hertfordshire and the plans afoot for the other locations mentioned. A blog can't detail every good bit of work or the many issues that Herts rivers suffer due to historical human activity. The EA aren't to blame; human activities are. The EA are doing their best to help and I get good value for money for my rod licence.